Did you hear the news? When companies invest in the employee experience through better employee communication management, the positive business impact is undeniable. 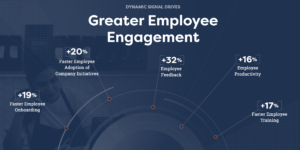 Companies using Dynamic Signal’s Employee Communication and Engagement Platform are reporting incredible results across every facet of their organizations. From increased retention and productivity, to a major boost in brand awareness and employee engagement, the DySi Team has been powering programs that move the needle for some of the world’s largest companies. The study, which surveyed more than 160 contacts from Dynamic Signal customer around the globe, found that companies experience significantly greater employee connections after implementing the DySi platform. The results? Business benefits such as nearly 40 percent faster employee communication, 35 percent increase in employees reached, 27 percent faster response to crisis, and 16 percent greater employee productivity. Not too shabby, huh! Dynamic Signal’s Custom Success Team was also a notable component of customer satisfaction and program outcomes. (Obviously!) In addition to positive responses to the support they received from the company, customers look to Dynamic Signal as a trusted advisor and partner. And to all of our customers who have been showing us the love, we want you to know- We’re your biggest fans and feel honored to support your work! If you haven’t already downloaded the Dynamic Signal Customer Impact Study, check it out here. And if you want to learn more about how you can transform your business, reach out today.